This one goes out to my brother who insisted kindly requested for me to replicate these after watching a YouTube video of Gemma from BiggerBoldBaking.com baking churros. 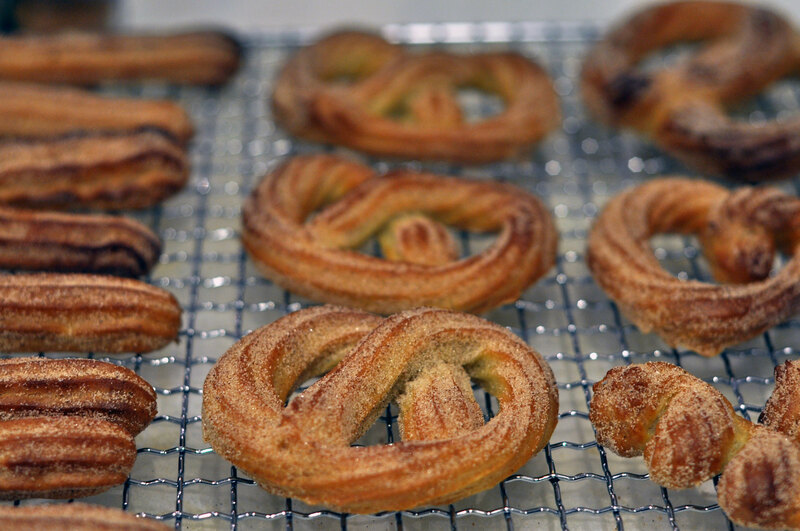 It never came across my mind to make churros at home, let alone BAKE them! 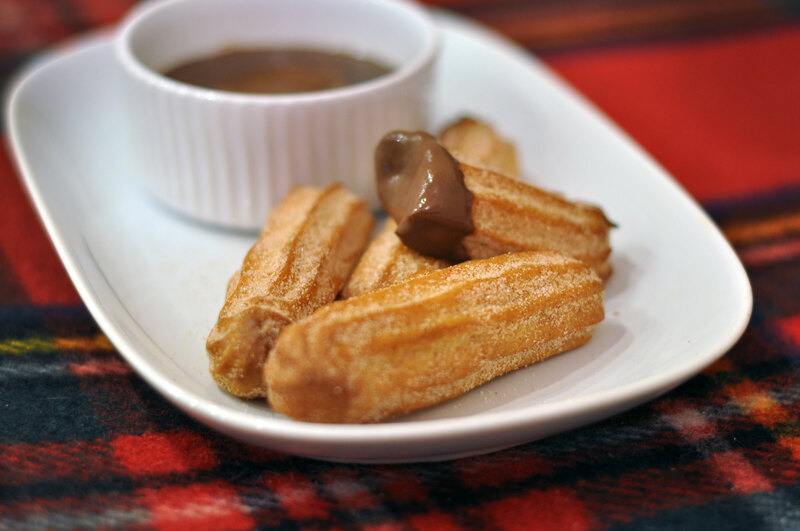 The base recipe to these churros is basically a choux pastry, and I kid you not, these were super easy to make. 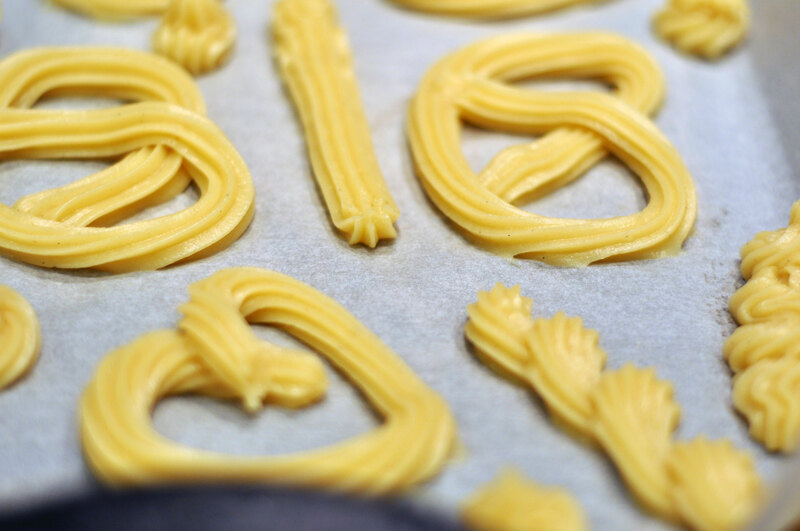 If the idea of even coming close to making choux pastry scares you, I promise you it isn’t as hard as it seems. However there are two things I’d change; the chocolate dipping sauce and the temperature they were cooked at. All ovens work differently so this might or might not be the case for you and for the dipping sauce, I wasn’t a fan of the consistency. I made my churros in two batches so I was able to play around with the temperature of the oven and the time they were in. My tip is to keep a watchful eye on them after 12 minutes. Preheat the oven to either 200°C or 180°C (you’ll have to play around with this one) and line your baking tray with parchment paper. In a saucepan over medium-high heat, add water, brown sugar, salt and butter. Heat until butter is melted. Once it starts simmering, whisk in the flour until a dough ball has formed. Stir the dough around to cook over low heat for about a minute, then set aside to cool slightly. Whisk the eggs and vanilla in a bowl, then incorporate the egg mixture bit by bit into your dough. This might look messy but stick with it! The end result will look like smooth creamy mashed potatoes. Relax, hard bit’s over. 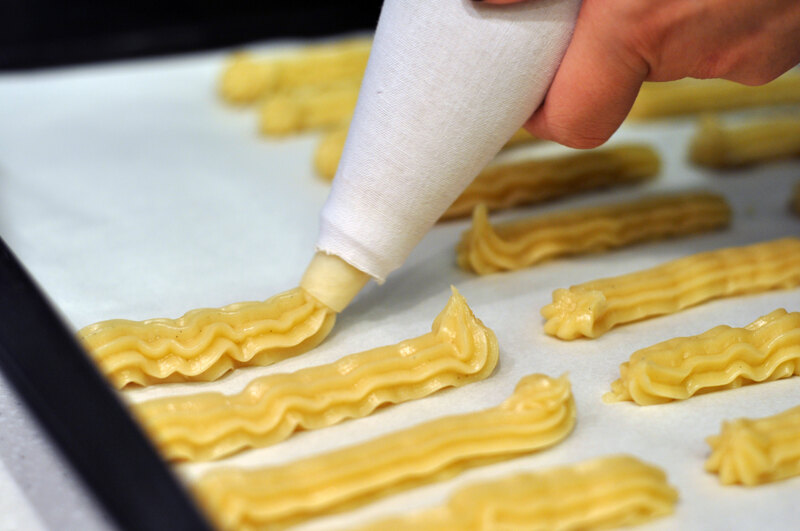 Transfer your dough into a piping bag with a star tip nozzle and pipe away. 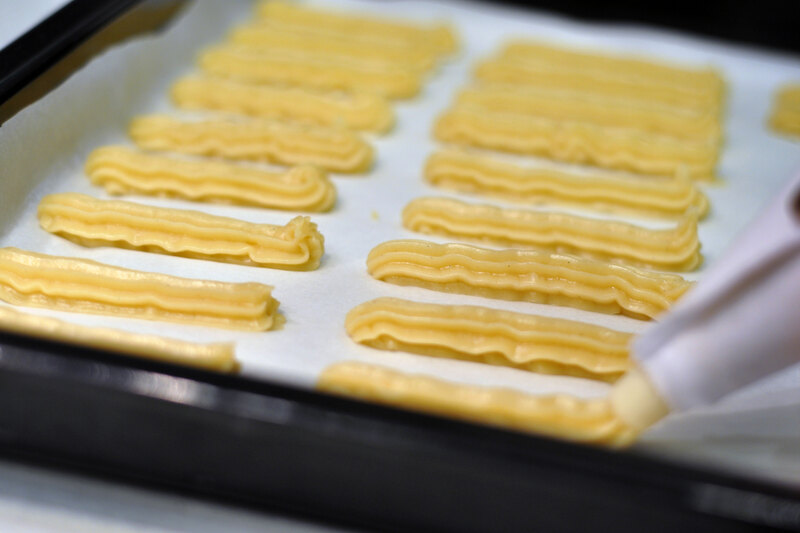 So Gemma’s recipe calls for the churros to be in the oven for 18-22 minutes. 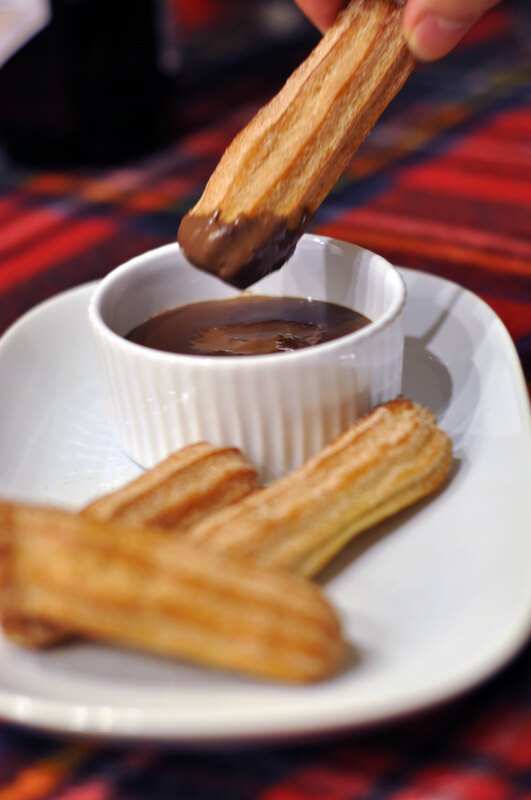 This all depends on the size of your churros. Like I said, watch them carefully as they brown pretty quickly. Once they’ve turned golden brown, you’ll need to turn off the oven and leave them in for 10 minutes to dry out. The temptation is real at this point. Resist. Heat double cream and milk in a saucepan until it comes to a light simmer, then pour over chocolate. Stir until fully incorporated. 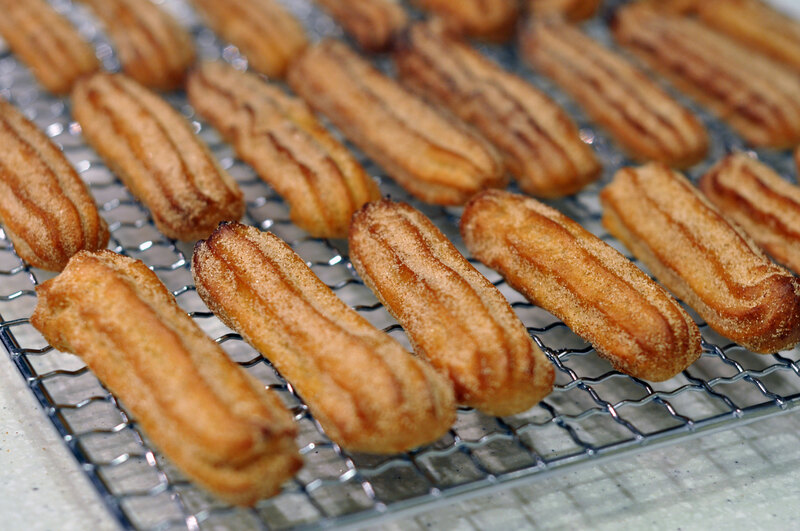 When the churros are out, toss them in the sugar coating. Transfer the chocolate sauce into small pots, plate up and serve! 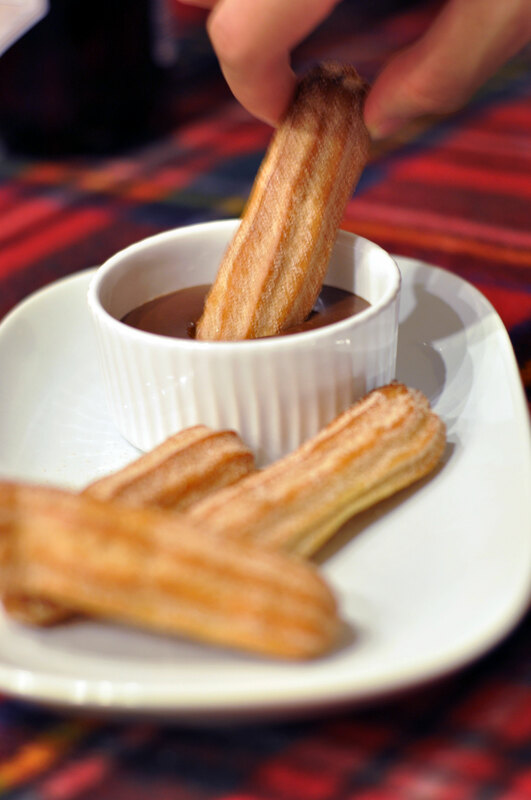 These churros have to be eaten straight away. 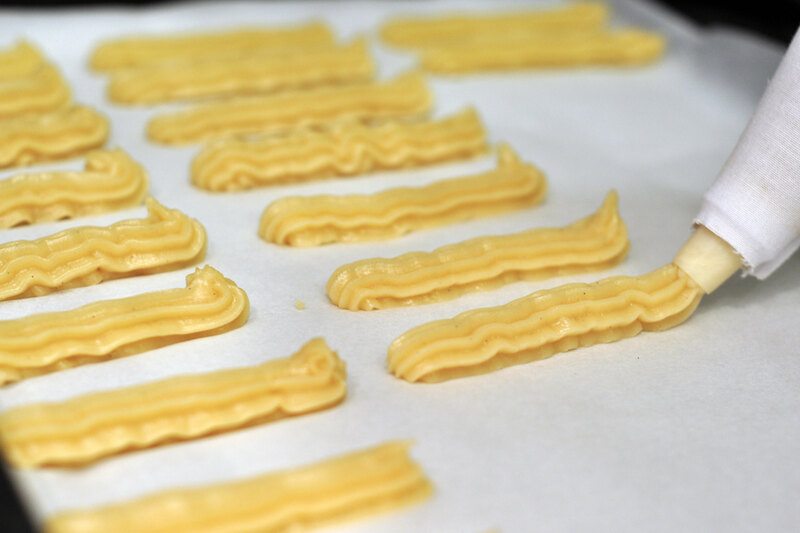 As they are made out of choux pastry, they won’t stay crisp for long. However I don’t see that as being a big problem! Do check out Gemma’s YouTube channel and her website for more fun recipes. Glad you’re lovin it! Let me know how it goes if you ever try the recipe out!